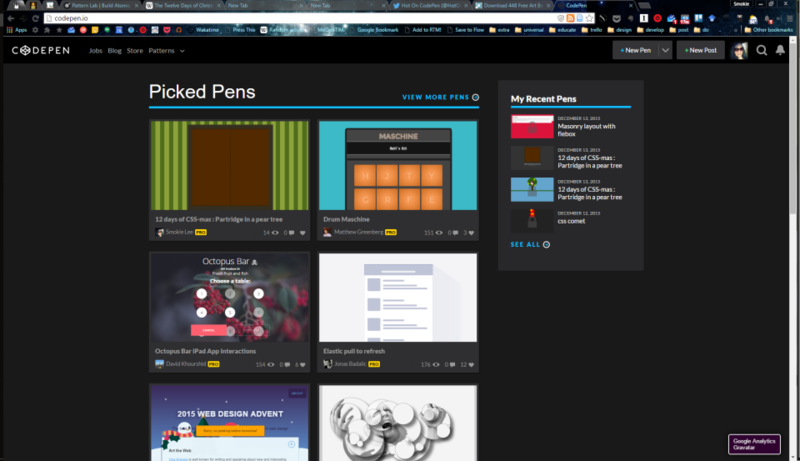 EDIT: This made the front page of CodePen! I really enjoyed Codevember and I wanted to do it again in December, but with all the holiday stuff I just couldn’t commit to it. I was talking with the husband about it and he suggested I do the 12 days of Christmas! I promptly turned that into the 12 Days of CSS-mas because puns are awesome and ran with it. I started out deciding that I really wanted a way for the things to “reveal” themselves, so I made a little shutter animation a few days ago to practice. Then I started on the general design of each day. For the partridge, I had a really complicated shape that took me a couple of hours to tweak into submission, then I slapped myself on the forehead and realized I could make this much easier on myself. I still have that other one around just for funsies though. The hardest part of this was the color, which I’ve always struggled with. It’s not obviously Christmas-y so it couldn’t really be those garish kind of colors, but it couldn’t be too muted or it would just come off as boring. Any constructive criticism is welcome. See the Pen 12 days of CSS-mas : Partridge in a pear tree by Smokie Lee (@xtoq) on CodePen.